Utah became a state January 4, 1896, the 45th state admitted to the Union. “This is the place,” were Brigham Young’s words when he chose this spot in the barren desert to settle. He and his followers experimented in farming, industry and society in this beautiful spot surrounded by mountains. Today’s well-planned, industrious city has 10-acre blocks and 132-foot wide tree-lined streets and is a center of the Mormon church. The famed Mormon Temple and Tabernacle are in Temple Square in the center of the city; the world’s largest genealogy library is here too. 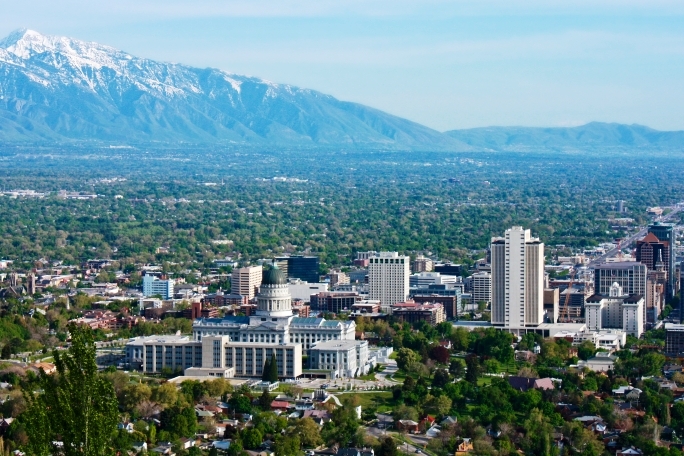 The classic capitol building sits on a hill at the north end of town and has a commanding view of the city and the Wasatch mountains. Monuments and statues mark the trials the Mormon’s endured, such as the tribute to the seagulls who ate the crickets who were eating the crops. Ski resorts dot the surrounding slopes, home to the 2002 Winter Olympics. The Great Salt Lake to the west is only 35 feet deep and is five times saltier than the ocean. The pride of place, the prettiness of everything, the hooked-on feeling for the arts and out of doors, the liveliness electric in the air, the mountains right outside the door. Mountains near: Wasatch Mountains, Oquirrh Mountains, Traverse Mountains. Kings Peak in the northeast part of the state is the highest point in Utah at 13,528 feet.